The statement of the representatives of local churches on the situation in Ukraine shows full support of the canonical Ukrainian Church by the world Orthodoxy, according to the Moscow Patriarchate Public Church Affairs Department Inter-church relations Secretary protoiereus Igor Yakimchuk. The hierarchs who took part in the meeting of the Inter-Orthodox Center Network on Study of New Religions and Destructive Movements in Slovenia are concerned with the violent actions against the Ukrainian Orthodox Church of Moscow Patriarchate (UOC MP), said the protoiereus. We consider the provocative reports about the Ukrainian Orthodox Church, aimed at religious discrimination, which are aired on Ukrainian TV channels unacceptable. The consequences of these reports are cases of violence against the priests and congregation members of the Ukrainian Orthodox Church, as well as acts of vandalism against temples. This increases, as a result, the tension in the Ukrainian society. The participants of the conference have condemned the acts of seizing Orthodox temples committed by the followers of the so-called Kiev Patriarchate. “The world Orthodoxy does not recognize the schismatics and condemns their violent actions,” the priest noted. St. George temple in Katerinovka village, Kremenetsky district of Ternopol region of Ukraine, was attacked by radical nationalists and “Kiev Patriarchate” representatives on September 21. From 20 to 30 people were injured as a result. UOC MP has made numerous statements on the persecutions of priests and seizures of Orthodox temples by the representatives of “Kiev Patriarchate” schismatics and armed nationalistic forces. 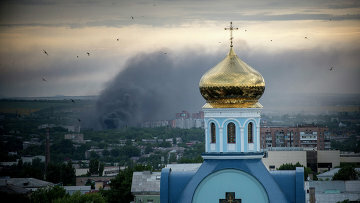 Approximately 90 UOC MP temples were damaged or destroyed during the punitive operation of the Kiev junta in Donbass according to Ukrainian Orthodox Church data. This entry was posted in News from Ukraine and tagged DPR, Kiev, LPR, nazis, Nazism, Orthodox Church, Ukraine. Bookmark the permalink.